Are you Making a Mistake by Waiting for Him? Only you can answer this question, but before you do, you want to be sure you’re looking at the whole picture in the right way. If you’re wondering if you are just wasting your time, start by doing some serious soul-searching and asking yourself some tough questions. There are signs that things may move to the next level like if your guy talks about his future and indicates that you are in it. That is a good sign, but if that's the case, then why don't you have a ring on your finger? What is it that he needs or is waiting for? Since there is no set amount of time for him to propose, you begin to wonder how long is too long? What is the cut-off date? How long should you be expected to wait? At some point, these thoughts will cross your mind, especially if you are tired of things the way they are and really ready to get married. The last thing you want to do is to make excuses for him or believe on some level that "he doesn't mean it" when he says he's not interested in getting married, or just doesn’t take you seriously when you hint around that you’d like to get married. scratch. Then the what-if's set in. What if you can’t meet anyone? What if you’re too old to have children if and when you do meet someone? What if you leave and then he decides to get married, but finds someone else? What if he just really doesn’t love you? This fear is what can keep us from really looking at the current state of the relationship and where it is going in the future. Have you ever met a guy who made it very clear that he wanted to get married and start a family? These guys have a mission to accomplish. They are ready, willing and able to settle down immediately if not sooner, and simply need to meet the woman they believe is the one. My husband was one of those guys. Obviously, I felt a very strong connection to him and just loved spending time with him. He kept asking me to marry him and I would just laugh, thinking that he was kidding, because we had been dating for less than a year. Finally, he asked me again and when I laughed, he made sure I understood that he was serious. To be honest, I really didn't know what to say because it was way too easy. I didn't do anything. I hadn't even been thinking about marriage (for a change). Why was he so determined to get married? How could this be right? Wasn't it supposed to be much harder than that? naturally fall into place without you having to “make” him do anything. But if he doesn't feel it, or something is going on with you that makes him unsure about a deeper commitment, is the time when you have to take a look at the relationship and decide what you want. Is there untapped potential that is worth waiting for? spend a lot more time waiting for him, and becoming increasingly fearful and discouraged. deep, loving commitment from your man. Welcome to the site and blog! Knowing how hard it is to meet the right guy, fall in love and have a committed, loving relationship, my goal here is to offer advice that can help you get from where you are now, to where you want to be. It isn't always easy, but it's a worthwhile journey in the end. 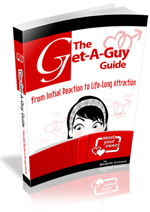 Want to know the secrets of attracting a great guy? Check out the Get a Guy guide! Marriage in trouble? Find ways to avoid and solve problems to keep your marriage strong.